Having a baby? Or have a friend who is? Or maybe your sister? Your daughter? You know, one of those people you know who would be having a baby? Or… maybe you want to make one of these for someone you don’t know at all. Heck, it could happen. I looked and looked for a tutorial or a pattern for a crib bumper that inspired me. I did see a few finished ones I liked on Etsy, but I wanted to make it myself. I wanted to be intimately involved with the nursery preparations for M. (As if growing the kid was not intimate enough? Must’ve been the hormones.) And then I did this version for my friend Kyra’s January baby, Aubrey. 18 layer cake squares, which are 9” x 9” each. You don’t have to buy a layer cake, you can cut your own from any fabrics if you like, I just liked the variety I got from a pre-made layer cake. 1 set of crib bumper batting, which consists of six panels that are 1” x 10” x 26” (I used Nufoam procured from the Joann empire) or you can cut your own batting pieces to 10 x 26. 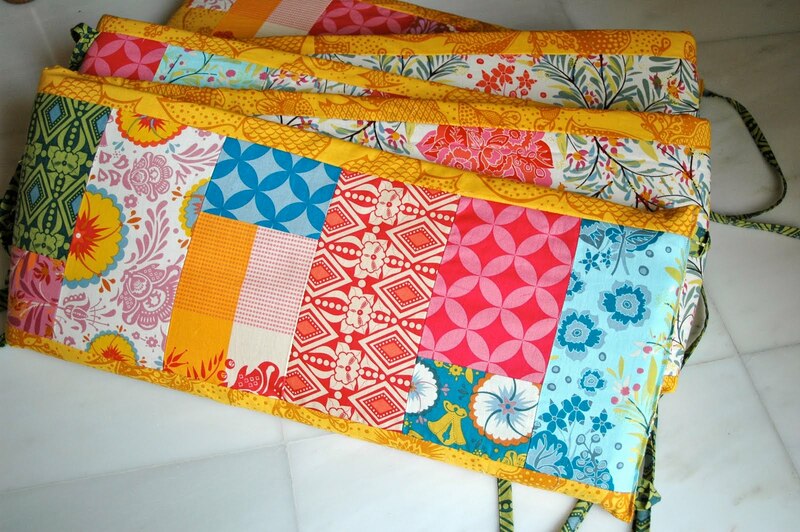 If you cut them yourself, you’ll need to consider your quilting approach—a low loft batting will need at least a little quilting to give it some body. Sashing: I used 2 strips that were 3″ wide and 156+” long. One of the strips I embellished with stitching, which reduced the width to about 2 1/2” wide. I made this my top edge. Cut your layer cake squares in half, creating two rectangles from your original squares. Take one of the rectangular stacks and measure it into thirds, or about a 6” and a 3” section, and cut. Make a mess. 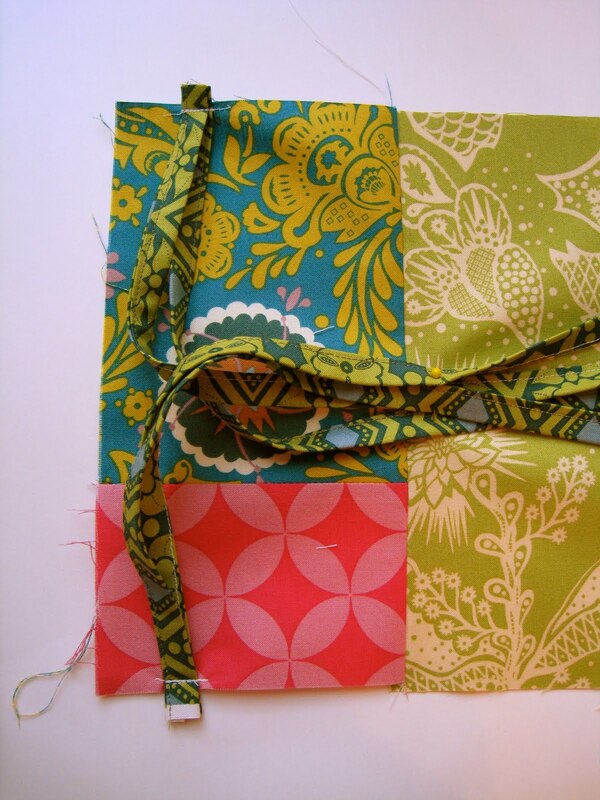 Mix and match these sections to make mixed squares until you’re happy with a layout. 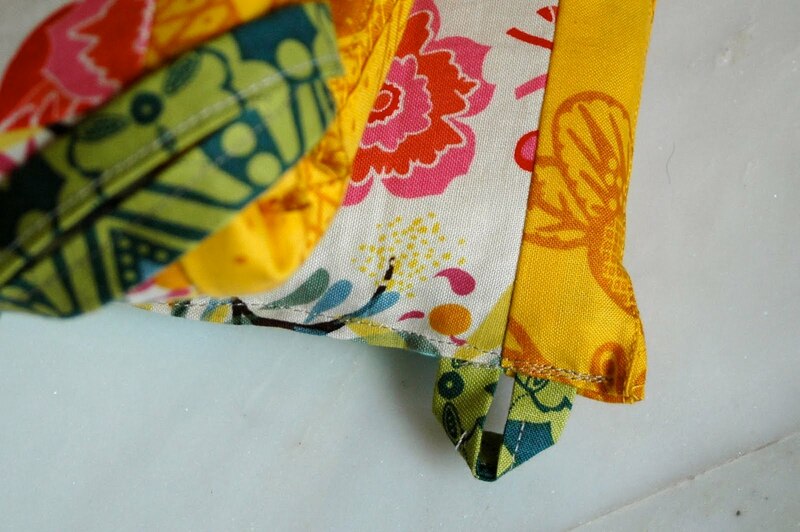 Stitch the two smallest rectangles together first with a 1/2” seam allowance that you’ll use throughout this project. Press. Stitch a large rectangle to the two smaller ones. Press. Trim the uneven side. Stitch another three squares together. Now we have the beginning of the two short sides (3 squares each) and two long sides (6 squares each) of your crib bumper. Now is a great time to lay them all out in order to make sure you know which end is the top side and which is the bottom, especially if your top and bottom trim are different. 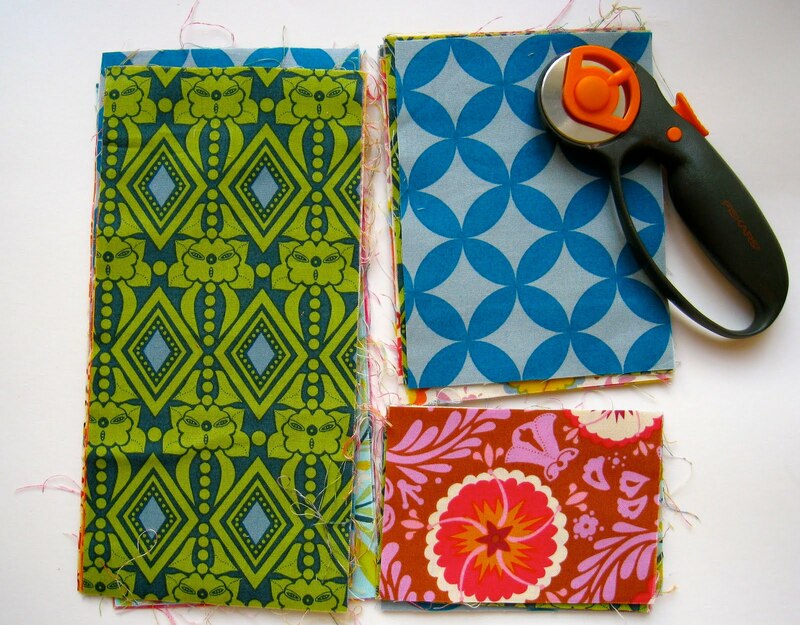 Cut your ribbon or double-fold stitched bias tape into 24 15” lengths (12 pairs). With the remaining ribbon or tape, cut two 3″ pieces that will become loops. 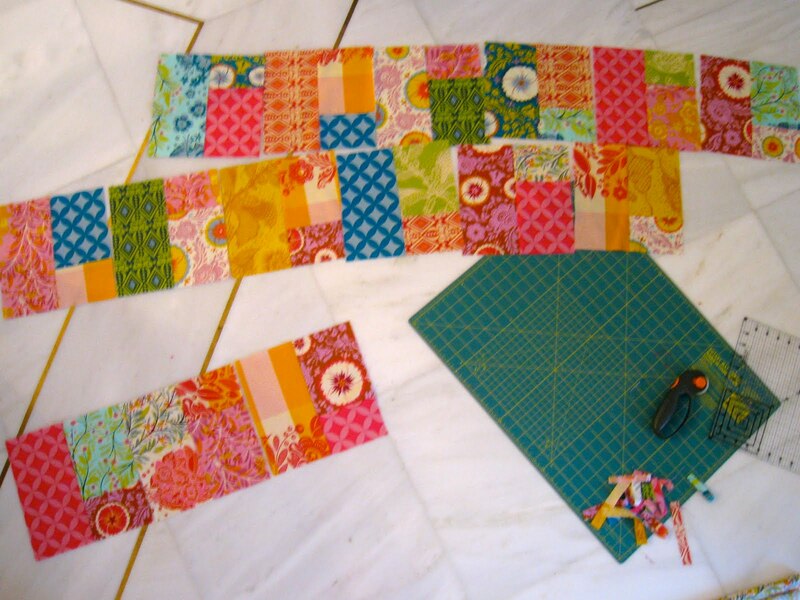 Pin right sides together, stitch your sashing down the length of one side, and then do the same on the other side. 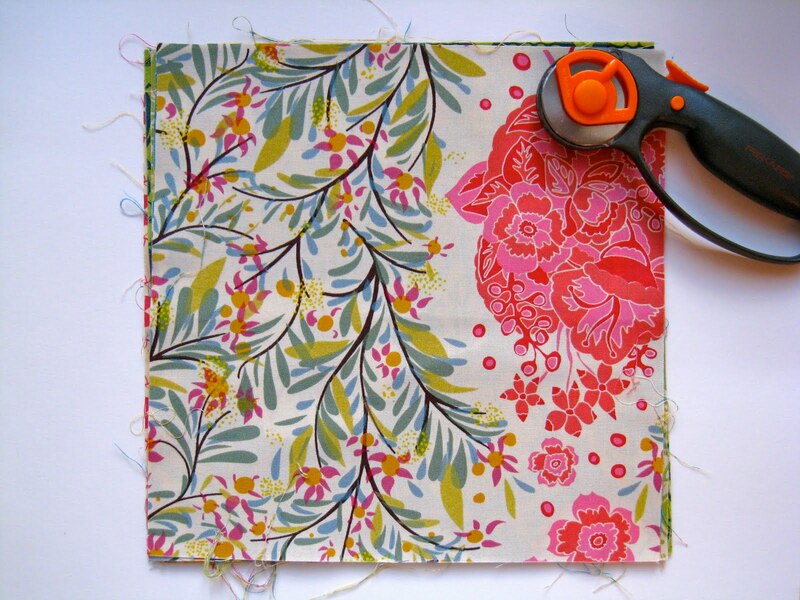 Pin and stitch your backing fabric, right sides together, to one piece of sashing and then to the other, so that you now have an inside-out tube. Using a rotary cutter and a straight edge, carefully trim a right edge on each end of the tube. Follow these steps to create another piece just like this one that will be the other short end of the crib bumper. To create the two long sides, you’ve already stitched six cake squares together. Pin and stitch two pairs of ties in the middle of each side before attaching the sashing, backing piece and squaring the ends like you did with the short sides. Choose the short piece that will end your crib bumper. Turn it inside out so that right sides are facing. Stitch the entire width of the tube with a 1/2” seam allowance. This closes one end of your bumper. Turn it right side out. This is the end that will have ties, but not loops. Choose the long piece that will connect to this short end and turn it inside out. Slide the short end of the bumper into the tube and match the ends that and will make one of the corners. Stitch all the way around the tube, closing the circle and trying to keep things even-steven so that you don’t have any weird bunchy spots. Turn right side out. Continue with the remaining short side and the remaining long side. Stuff your very very very long beautiful crib bumper tube with batting. Now is the time to quilt the center section if you like. I can’t give you much in the way of pointers in this area, since I chose not to do it. I felt like the Nufoam held it’s shape well enough without it, but it looked like it could be machine stitched a bit if you’d like to. A lower loft quilt batting would probably need a good bit of pinning and then quilting in order to give it a bit of rigidity to stand up in the crib. Very sturdily stitched strategically placed buttons or small areas of decorative stitching could be a good alternative. Back to it. We’re almost done. Make 3” loops with your bias tape or ribbon and pin them in place 1” from each corner of the closing end. The loops are inside the tube and the ends stick out. Like we did the ties above. Stitch these in place 1/4” from the edge of your fabric, and then fold the ends of the tube in so that the loops stick out and the ends are tucked in. Stitch the entire width of the tube with a 1/2” seam allowance. This closes your bumper! Ta da! Whew! High five! Please, oh, please, oh pleeeeeeeeease send me your feedback if you make one. I’d love to see your finished work or hear your complaints about my descriptions of the process and improve the tutorial. I might even make this into a pattern some day since I know that some folks would much prefer to see something like this laid out than try to follow the description. I’d loooove to hear what you think? Yes, I’m already just sitting in front of my computer, just watching the inbox, hoping hoping hoping for your message. You just go about your business. When you’re ready to talk, I’ll still be here. Waiting. P.S. I thought you might like to see another version of this. Happens to be the one I made first, for my own M. Here it is– instead of layer caking it, I made a very long strip of what were essentially jelly roll pieces that I cut partly from upcycled materials and partly from new goodies. I have a little bit of “video” experience with watching (and copying) your process on this, but I think the tutorial is perfect. Totally, and amazingly time consuming but sooooo do-able and just look at the results. Stunning baby bedding. I love the addition of the loops on the second set you made. I think that will make the in-crib assembly much easier. And yes, it is totally quiltable. I did a very simple “stitch-the-ditch” on mine with a similar batting thickness. I think the thinner batting would lend itself very well to a more complicated quilting. But after all that cutting, stitching, and stuffing–you’d have to be a saint to throw in stippling as well. Oh, and the picture of the bumper definitely has to go up as one of your tute buttons. Soooooo colorful~! thanks for the tute! I made one for my daugher almost four years ago – but it’s total crap and not even slightly cute. Love this one! I plan to make this one for sure. Thank-you!! I’m getting ready to make my version of your bumpers, but have one question. Since the 9 nch squares for the one side end up being 8 inches in height once patchworked together, but you cut 9 inch sides for the back, is the trim longer on the front/back vs the reverse? I cut my long backing 9 inches, but can’t tell if I should have really made it 8 inches to match the patchworked side. And then once seam allowance is eaten up it’ll really be 7 inches if I’m figuring it right, so I think I’d need a 4 inch trim piece if I did it that way. Hope you can respond before I have to make my decision, I know either way could be fine, just not sure which will look more intentional. the fabrics on this are gorgeous. where did you buy the layercake from? THANK YOU! I just used your crib bumper tutorial and it totally rocked my socks. I plan on blogging my journey with your lovely tutorial soon. There were a few suggestions I would make only because I’m a dingbat and need things completely spelled out for me. But overall a fantastic tutorial. Thank you for the time you invested in making it. I am in love with this tutorial. My only question is what are the loops for in the final step? I’d LOVE to know more about the “other version” bumper pad with the vertical strips of fabric. I can see minky fabric above and below the strips but it’s hard to tell exactly. It doesn’t look like a simple operation!! I MADE THIS! Thanks so much for the tutorial. It was my first completed quilting project. I’m in the process of doing this now! I’m so excited! This is my third daughter & to make her own custom bedding is just amazingly awesome! Thank you soooo much for the tutorial! I can’t wait to see it when it’s done! I’m even thinking about doing the above process & turning it into a crib quilt! Just not sure on how many blocks I would need. 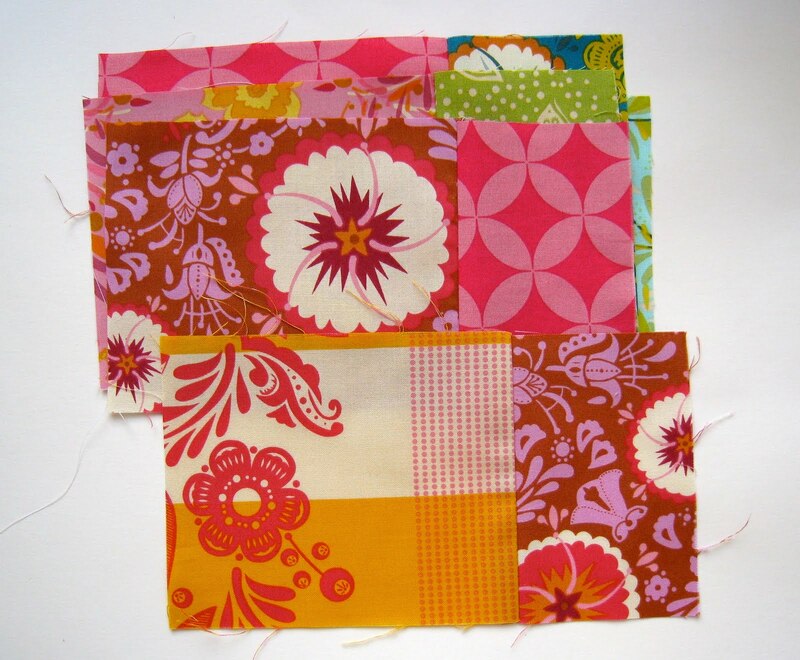 I’m a newbie to quilting &patchwork but I love it indeed! P.s -I will post pictures soon! In flickr n my blog. Thanks again! sedwards, my versions is actually reversible. The next to last photo shows the ties tacked at the very edge so that once the other side is sewn on, right sides together, and then flipped right sides out, the ties are on the top and bottom edge. 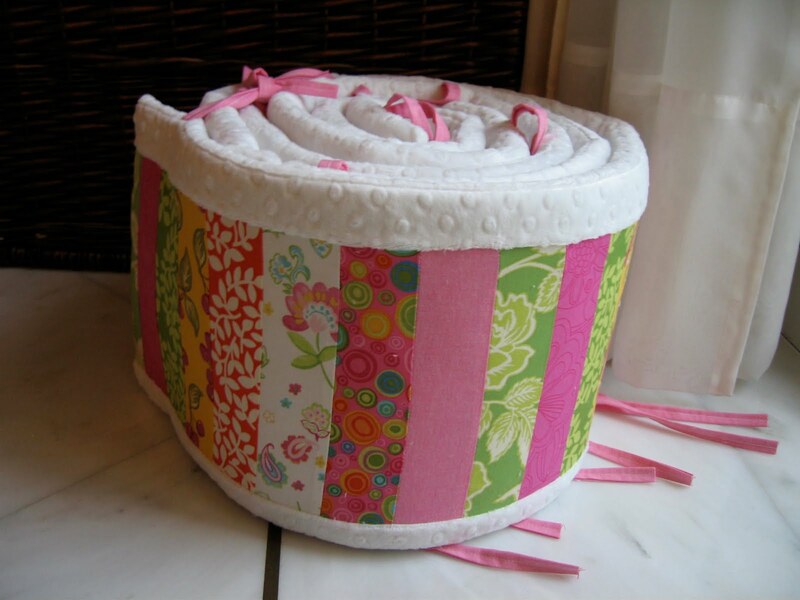 Which is in the middle of the sashes on each side, but you could put it in the crib either way. I hope that makes sense? I love the colors!!! 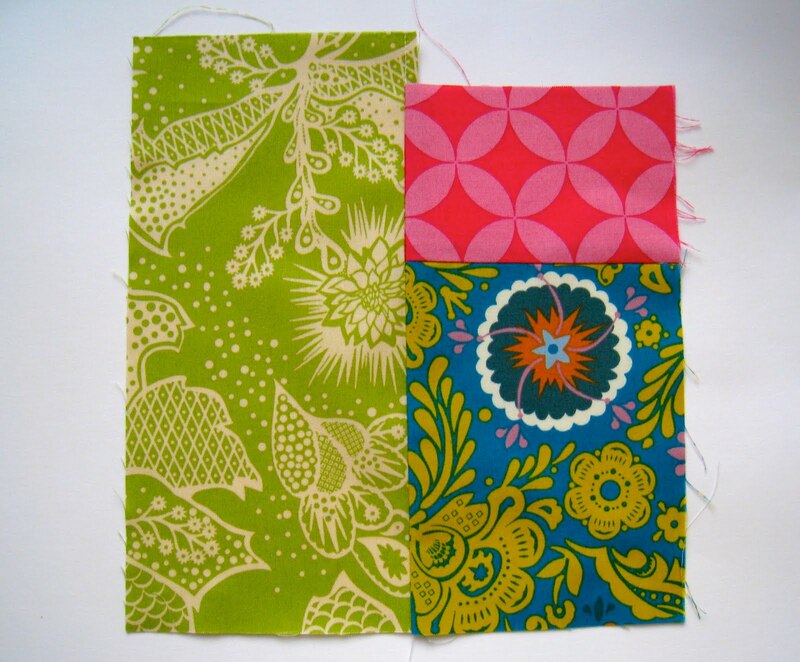 Whose fabric did you use? Thank you for this fantastic tutorial! My Mom and I made one for my daughter’s room and I blogged about it here: http://pursewna-pursewna.blogspot.com/2011/07/baby-girl-2s-room-part-3-crib-bumper.html. Thank you for making your tutorial and pictures easy to understand and with such great details!!! I am SUPER pleased with how our bumper turned out!